That is it for this evening, some great stuff coming in from teams involved in the FA People's Cup. We are back again on Saturday for day two of the first round from 12:00 GMT where we want more stories from you. how you can get into football. Hope to hear from you tomorrow, goodnight. Nicole: @YorksStPauli FC Team 2. Media stars. Leeds City Futsal: This isnt futsal! Lost one, won one with @djharsley our only player to score! BBC Get Inspired's Chris Whyatt in Romford: "Down to the last four in the U16s! Buckhurst Hill FC, managed by Karl Thompson, are hotly tipped to progress. Karl gave us that tip..."
EastLondonLadies FC: @NickBrightDJ Filming for BBC Get Inspired with Nick Bright. Come on ELL! "In the opening game of the heats here Rosliston Vets were unaffected by their 45 mile/two hour journey en-route to PlayFootball Nottingham to secure an opening 4-2 victory over Often Old Boys." Nicole: @YorksStPauli FC 2 lose 4-1 against Radio Socialites despite great goal by Abd. A man with regret. Oh what could have been, Mark, what could have been! Nicole: @YorksStPauli FC about to play again. Former footballers Kevin Kilbane and Trevor Sinclair joined Football Focus presenter Dan Walker, BBC Breakfast presenters Charlie Stayt and Naga Munchetty and a host of other well know faces to contest the inaugural Get Inspired Cup. The grudge match between BBC Breakfast and BBC Sport was held to encourage people to sign up for the FA People's Cup. Kieran O'Brien: 6 Portuguese and an Irishman coming together to form OSS Benfica!! Yorkshire St Pauli - are you ready? The lucky boys of Yorkshire St Pauli are in front of the TV cameras in Leeds and they all look extremely excited and raring to go. Almost. The guy on the right looks...in deep thought. Twitter account says: "When we started YSP FC a couple of years ago, I never thought I'd be following our results on the BBC website." Harriet Persson Brew: Just finished filming today for @bbcgetinspired had a laugh and ready for #PeoplesCup on Sunday! Whoop. PlayFootball Crosby: Eve of the @FA #PeoplesCup KO is traditional Sat 3pm. #gamefaceon looking for a 5-a-side Figo! Dan Baxter: Big day tomorrow playing in the #PeoplesCup in Blackpool. 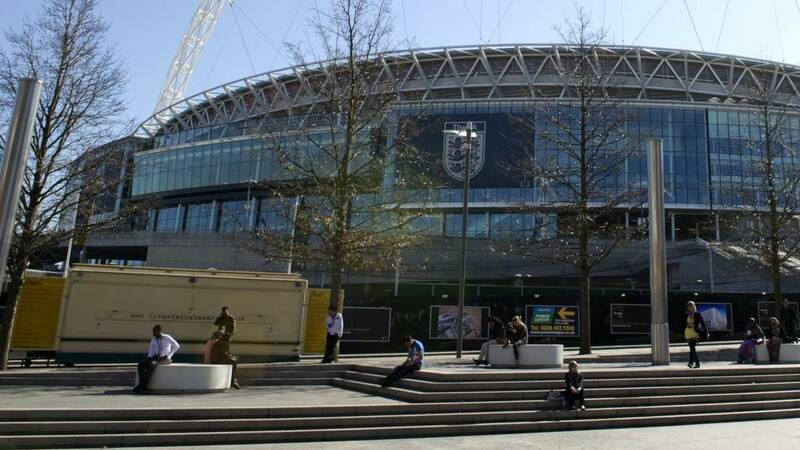 Our #roadtowembley starts here. Getting ready for the first round of the FA People's Cup? 1996, 1999 and 2004 FA Cup winner Phil Neville talks us through his pre-match routine as a professional including food, relaxation and stretching. He also offers suggestions on mental preparation, specific muscle groups to focus on and preparing for a game after a full day at work. Jamie Morton: Taking a @SouthAshfordFC U16s team to @goals_dartford later for the @FA #PeoplesCup looking forward to it @bbcgetinspired. In Romford, the U14 & U16 FA People's Cup boys teams get a surprise guest as the FA Cup trophy itself arrives to show support. Which of you will be there on finals day on Monday 25 May? Have you wondered who designs football team mascots? In Blue Peter's new competition, they are giving YOU the chance to design the mascot for the 2015 FA Cup Final. They want you to design a brand new mascot which celebrates football and the FA Cup! The winning design will be made into a suit to be worn by a Blue Peter presenter at the FA Cup Final. It is a nervous wait for the players in Romford who are waiting to find out their first opponents tonight. Looks like organisers are going for the 'slip of paper out of the cardboard box' routine. Becky Doggett: Looking forward to seeing @BenyonPark in the FA #PeoplesCup in Leeds tonight! Come on Lads! South Ashford FC: Good luck to our U16s who travel to @goals_dartford later today for the @FA #PeoplesCup @bbcgetinspired. Goals Black Country: Just received our 34th entry for this weekends @FA #peoplescup tournament- 'Le Saux Solid Crew'. They're currently winning on team name alone. A German team in the competition? We said anyone can enter the People's FA Cup, but didn't expect a German second division side to send in their applications. OK, not entirely true but Yorkshire St Pauli are made up of the team's supporter's club members. They love the club partly because they are rubbish but mainly because they stand for anti-fascism and anti-racism. They also work closely with a Leeds refugee charity to provide not only financial support through our membership but also by welcoming refugees and asylum seekers into the group football games. They have entered two teams and with a mixture of members and refugees. Nicole: @YorksStPauli FC are getting ready for #PeoplesCup. Seven-time motorsport world champion Carl Fogarty visited 'City in the Community' to take part in one of their weekly walking football sessions. The rules of the game are similar to those of 5-a-side football - but running is forbidden. Walking football is one of the categories included in the FA People's Cup. The national 5-a-side football tournament is open to established teams as well as individuals looking to join a team. And finally, top of the lot: Llanfairpwllgwyngyllgogeryantysiliogogogoch Rovers. If they win it, it is going to be a difficult job fitting all that on the trophy. BBC Get Inspired's Chris Whyatt in Romford: "Tension building in dusky Romford! U14s and U19s boys tonight - 35 teams in total, only two can go through to the semis. Icy cold in Essex, but will soon heat up once the action kicks off." Goals Soccer Centres: READY @bbcgetinspired. READY @FA. READY @goals_soccer. READY #PeoplesCup. ARE U? daniel ryan: Getting ready for this weekend @goalsnorwich hosting @bbcgetinspired People's Cup. Looking good! The FA People's Cup welcomes male, female and disability players across 10 categories - ranging from under-12s through to veterans (over 35s). It also features walking football, which caters to those who enjoy playing the beautiful game at a slightly more sedate pace! A total of 4306 teams have signed up, which makes it a huge 30,000+ players. Now that is what you call a competition! How will the FA People's Cup work? The competition will take place over three rounds. The first round starts today and ends on Sunday. Eight regional venues will host the semi-finals, on 24-26 April. Finalists from the disability tournament will be decided through a series of disability football festivals taking place in March. Up to 27 disability festivals will take place nationally. Are you out there playing today or have you got a team signed up? Send in your messages. We want to see the best pictures and team names. Don't forget to mention where you are. We also want to hear from those who have not been able to take part in the competition. Give us your stories of why you didn't enter. What is the FA People's Cup? BBC Get Inspired teamed up with the Football Association and the country's leading small-sided football providers to launch the FA People's Cup, a free knockout competition which gives players the chance to play in their version of the FA Cup. Hello and welcome to live coverage of the FA People's Cup, a tournament launched to give every man, woman, young or old, the opportunity of footballing glory. Over the next few hours, we will be reading about the stories of those taking part, what inspired them and how far they think they can go in the competition. We will also be kept informed of the latest from a few of our reporters at locations from around the country. So, strap yourselves in, the rollercoaster journey of YOUR competition begins right here. Ever dream about winning the FA Cup? Scoring the winning goal before climbing the 107 steps in Wembley Stadium, shaking the hand of royalty and holding aloft the famous trophy in front of all your supporters?